Department of Physics, Ranaghat College, Ranaghat, India. In this paper, we have studied the Hawking radiation of massive spin-1 particles from the black holes in (2+1) dimensions with non-trivial dilaton fields. We consider two special varieties of these black holes one is static charged and other is spinning electrically neutral. By applying the standard method of WKB approximation and Hamilton-Jacobi ansatz we have shown the tunnelling probability and Hawking temperature of massive bosons accordingly. In the certain limit of the dilaton coupling for spinning neutral case we have recovered the Hawking temperature of the BTZ black holes as well. Black holes have become the most fascinating objects to study in the context of Einstein’s general theory of relativity over the last century. According to Hawking [1-3] these black holes emit thermal radiation at a constant temperature across the horizon. This temperature is known as Hawking temperature. Several methods have been developed to understand Hawking radiation and calculate Hawking temperature after the original method proposed by Hawking . In recent year’s semi-classical approach [4-29] of deriving Hawking radiation as tunnelling process captured lot of attention. This semi- classical tunnelling method is considered to calculate the imaginary part of the action for the (classically forbidden) process of s-wave emission across the horizon (Kraus and Wilczek [30-32]), which is related to the Boltzmann factor for emission at the Hawking temperature. Applying the WKB approximation the emission and absorption probabilities for the classically forbidden trajectory of the s-wave coming from inside to outside of the horizon is given by, , where I is the classical action of the trajectory of the tunnelling particles. In calculating the Hawking temperature two different methods were developed to evaluate the imaginary part of the action- one was proposed by Parikh and Wilczek  and the other method used by Angheben et.al. , this is an extension of the analysis done by Srinivasan and Padmanabhan . First method deals with the part of the action that contributes an R imaginary term is , where Pr the emitted null s-wave is. Hence one can calculate imaginary part of the action by using the Hamilton’s equation and the knowledge of null geodesics. This method is known as null geodesic method. 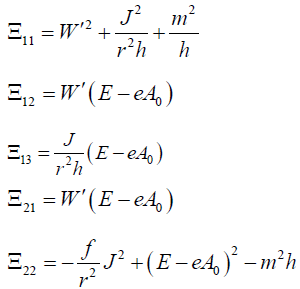 The second method is known as the Hamilton-Jacobi method where the imaginary part of the action is derived from the Hamilton-Jacobi equation by choosing suitably the form of the action. This tunnelling method as well applied for the black hole radiation of spin and spin particles and photons at Hawking temperature [24,25,33-36] close to the black hole horizon. In continuation of using further the tunnelling method to model spin-1 (e.g. bosons like W± and Z) particle emission from black holes S. I. Kruglov  investigated Hawking radiation in (2+1) dimensions. Recently various authors have analysed Hawking radiation of vector bosons in the context of static and rotating black holes [37-44]. Apart from the various black hole solutions with or without cosmological constants here we are interested black holes with nontrivial dilaton fields which are neither asymptotically flat nor anti-de Sitter. We are interested to investigate Hawking radiation and to calculate Hawking temperature of a class of Einste in-Maxwell dilaton black holes with arbitrary dilaton coupling as discovered by Chan and Mann [45-48]. Therefore our purpose is to study the tunnelling of massive vector boson W± through the space- time of a static charged  and spinning charge neutral  dilaton black holes in (2+1) dimensions. In case of static charged black holes we derive the field equation of the charged boson from the Lagrangian given by Glashow-Weinberg-Salam model. After that we use the WKB approximation and then apply the Hamilton- Jacobi ansatz, for solving the radial part of the action by using the determinant of the matrix equals zero, we found the tunnelling rate and the corresponding Hawking temperature. For the latter case of spinning black hole we use Proca equation as the field equation of the massive vector field which is neutral. We again calculate the tunnelling rate in case of spinning dilaton black holes and also recover associated Hawking temperature of this class of black holes. We are mainly interested to study Hawking radiation in the background of these special classes of black holes for generic values of dilaton coupling. We have also obtained two known class of black holes like BTZ  and MSW* in the two special limits of the dilaton coupling and also can reproduce the Hawking temperature for those particular classes of black holes. This paper is organised as follows. In section 2 we consider static charged black holes with nonzero Dilaton filed and investigate the Hawking radiation of charged vector bosons and estimate the Hawking temperature. In section 3 we also study tunnelling of massive vector bosons which are uncharged in the spinning neutral dilaton black hole space- time. We conclude our study in section 4. Q Is related to the electric charge whereas β, γ are integration constants. k is a real number. 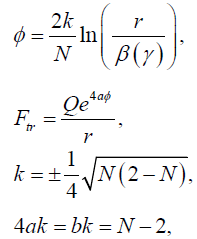 Last relations in equation (5) are among the various dilaton couplings, finally related with a single parameter N. As (M,Λ) > 0 the black hole solutions exist only in the domain . When N=1, (2) reduces to the 2+1 dimensional MSW. For N=2 and Q=0, metric (2) represents uncharged BTZ black hole which might be the special case of BTZ black hole given in . In general due to the presence of nontrivial dilaton, black holes are neither asymptotically flat nor anti-de Sitter (de Sitter). 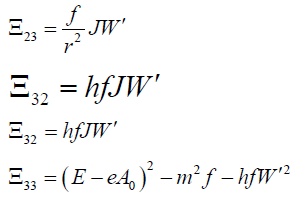 Following our earlier discussion the Hawking temperature derived in equation (23) reduces to the Hawking temperature for charged MSW black hole for N=1 which is exactly matched with the result presented in . Furthermore for vanishing Q we can get from equation (24) for uncharged static BTZ black hole , for uncharged MSW black hole the temperature would be , which only depends on the cosmological constant Λ. Here p+=p(r+) and p-=p(r-) are the location of outer and inner event horizon respectively for the BTZ black hole. In this study we have presented the semi-classical tunnelling processes to understand Hawking radiation of massive vector particles either charged or uncharged, tunnelling through the event horizon of the particular class of dilaton black holes in 2+1 dimensions. We have computed first the probability of tunnelling of charged spin-1 (W+ bosons) particles through the event horizon of static charged black hole which has non-trivial dilaton field. Further we have calculated Hawking temperature at horizon of this charged black hole for arbitrary coupling parameter N. This results exactly matched with the Hawking temperature obtained by the other method in references  for arbitrary coupling N, and in  for N=1. In the later part of the paper we have mainly concentrated on tunneling methods by using Proca equations of massive spin-1 field to find the tunneling probability of outgoing particles and the Hawking temperature at the outer event horizon of the neutral spinning dilaton black holes. Again we have derived Hawking temperature for general dilaton coupling. By tunning that coupling at certain values we have been able to show the radiation temperature of a particular class of black holes like BTZ which is consistent with the result derived in  in the context of Hawking radiatiom. It would also be interesting to study further the tunneling probability of other type of spin particles across the horizon of the black holes considered here. I would like to thank R. Uniyal for providing some references. 1elaborate discussion on the MSW black holes are given in  and in the original paper . 2$h$ and $\hbar$ denote two different quantity. Hawking SW. Particle Creation by Black Holes.Commun. Math. Phys. 1975;43:199-220. Hawking SW.Black hole explosions? Nature. 1974;248:30-31. Gibbons GW and Hawking SW. Cosmological event horizons, thermodynamics, and particle creation. Phys. Rev. 1977;D15:2738. Srinivasan K and Padmanabhan T. Particle production and complex path analysis. Phys. Rev. 1999;D60:024007. Parikh MK and Wilczek F. Hawking radiation Astunneling. Phys. Rev. Lett. 2000;85:5042. Shankaranarayanan S,et al.Hawking radiation in different coordinate settings: Complex paths approach. Class. Quant. Grav. 2002;19:2671. Angheben M,et al. Hawking radiation as tunneling for extremal and rotating black holes. JHEP. 2005;0505:014. Nadalini M, et al. Hawking radiation as tunneling. J. Physics A Math. Gen. 2006;39:6601. Arzano M, et al. Hawking radiation as tunneling through the quantum horizon. JHEP. 2005;0509:037. Vagenas EC. Are extremal 2-D black holes really frozen?.Phys.Lett. 2001;B503:399. Vagenas EC. Semiclassical corrections to the Bekenstein-Hawking entropy of the BTZ black hole via selfgravitation. Phys.Lett. 2002;B533:302. Vagenas EC. Complex Paths and Covariance of Hawking Radiation in 2D Stringy Black Holes. NuovoCim. 2002;B117:899. Medved AJM. Radiation via tunnelling in the charged BTZ black hole. Class.Quant.Grav. 2002;19:589. Medved AJM. Radiation via tunneling from a de Sitter cosmological horizon.Phys.Rev. 2002;D66:124009. Qing-Quan J and Shuang-Qing W. Hawking radiation of charged particles as tunneling from Reissner-Nordstrom-de Sitter black holes with a global monopole.Phys.Lett. 2006;B635:151. Qing-Quan J, et al. Hawking radiation as tunneling from the Kerr and Kerr-Newman black holes. Phys. Rev. 2006;D73:064003. Shuang-Qing W and Qing-Quan J. Remarks on Hawking radiation as tunneling from the BTZ black holes. JHEP. 2006;0603:079. Hui-Ling L, et al. Tunneling through the quantum horizon. Phys. Lett. 2006;B641:139. Wenbiao L. New coordinates for BTZ black hole and Hawking radiation via tunnelling. Phys. Lett. 2006;B634:541. Jingyi Z and Zheng Z. New coordinates for Kerr–Newman black hole radiation. Phys. Lett. 2005;B 618:14-22. Jingyi Z and Zheng Z. Hawking radiation of charged particles via tunneling from the Reissner-Nordstroem black hole. JHEP. 2005;0510:055. Jingyi Z and Zheng Z. Charged particles' tunnelling from the Kerr-Newman black hole.Phys.Lett. 2006;B638:110. Cheng-Zhou Liu, et al. Charged particle's tunneling from a dilaton black hole. Phys. Lett. B. 2006;639:670. Kerner R and Mann RB. Tunnelling, Temperature and Taub-NUT Black Holes. Phys. Rev. 2006;D73:104010. Kerner R and Mann RB. Tunnelling from Godel black holes. Phys. Rev. 2007;D75:084022. Kerner R, Mann RB. Fermions tunnelling from black holes.Class.Quant.Grav. 2008;25:095014. Akhmedov ET et al. Hawking temperature in the tunneling picture.Phys.Lett. 2006;B642:124. Mitra P. Hawking temperature from tunnelling formalism. Phys. Lett. B.2007;648:240. FuJun W, et al.Isotropic coordinates for Schwarzschild black hole radiation. Phys. Lett. B. 2007;650:317. Kraus P and Wilczek F. A Simple Stationary Line Element for the Schwarzschild Geometry, and Some Applications. 1994. Kraus P and Wilczek F. Self-Interaction Correction to Black Hole Radiance.Nucl. Phys. 1995;B433:403. Kraus P and Wilczek F. Effect of selfinteraction on charged black hole radiance.Nucl. Phys. 1995;B437:231-242. Yale A and Mann RB. GravitinosTunneling from Black Holes. Phys. Lett. 2009;B673:168. Jing J. Hawking Radiation of Rarita—Schwinger Fields of a Stationary Charged Black Hole. Int. J. Theor. Phys. 2003;42:801. MajhiBR and Samanta S. Hawking Radiation due to Photon and GravitinoTunneling. Annals Phys. 2010;325:2410. Yale A. Exact Hawking Radiation of Scalars, Fermions, and Bosons Using the Tunneling Method Without Back-Reaction. Phys. Lett. 2011;B697:398. Kruglov SI. Black hole radiation of spin-1 particles in (1+2) dimensions. Mod. Phys. Lett. A. 2014;29:1450203. Chen GR, et al. Vector particles tunneling from BTZ black holes. Int. J. Mod. Phys. 2015;D 24:1550005. Xiang-Qian L and Ge-Rui Chen. Massive vector particles tunneling from Kerr and Kerr-Newman black holes. Physics Letters B. 2015;751:34-38. Ovgun A, Jusufi K. Massive Vector Particles Tunneling from Noncommutative Charged Black Holes and its GUP-corrected Thermodynamics.Eur. Phys. J. Plus. 2016;131:177. Sakalli I and Ovgun A. Hawking Radiation of Spin-1 Particles from Three Dimensional Rotating Hairy Black Hole.J.Exp.Theor.Phys.2015;121:404-407. Sakalli I and Ovgun A. Quantum Tunneling of Massive Spin-1 Particles From Non-stationary Metrics. Gen. Relativ. Gravit. 2015;48:1. Sakalli I and Ovgun A. Tunneling of Vector Particles from Lorentzian Wormholes in 3+1 Dimensions. Eur. Phys. J. Plus. 2015;130:110. Jusufi K and Ovgun A. Tunneling of Massive Vector Particles from Rotating Charged Black Strings. Astrophys Space Sci. 2016;361:207. Chan KCK and Mann RB. Static Charged Black Holes in (2+1) Dimensional Dilaton Gravity. Phys. Rev. 1994;D50:6385. Mandal G, et al. Classical solutions of two-dimensional string theory. Mod. Phys. Lett. A6. 1991;1685. Banados M, et al.Black hole in three-dimensional spacetime. Phys. Rev. Lett. 1992;69:1849. Chan KCK and Mann RB.Spinning black holes in (2+1)-dimensional string and dilaton gravity. Phys. Lett. 1996;B371:199. Brown JD and York JW. Quasilocal energy and conserved charges derived from the gravitational action. Phys. Rev. 1993;D47:1407. Sakalli I. Effect of the cosmological constant in the Hawking radiation of 3D charged dilaton black hole.Astrophys.Space Sci. 2012;340:317-322.